Pairing contemporary topics with traditional quilt patterns, Katherine Knauer prints much of the fabric she uses with images of environmental concern or war. 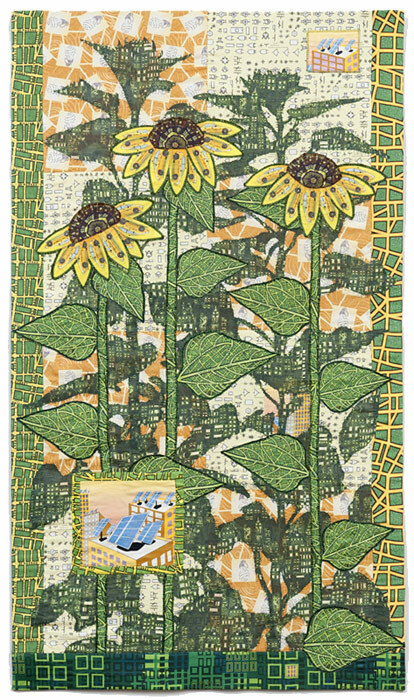 This juxtaposition of dynamic surface imagery and a medium most often associated with comfort and warmth imbues her quilts with personal meaning and the energy of an unexpected fusion; visual puns are complimented by labor-intensive craftsmanship. Knauer’s work has been described as “a mirthful approach to the macabre”.